This is me doing a salad faceplant. I know! I’m aware. Salad and faceplant are probably not two words that you associate – especially together – when you visit this blog. But it’s happening. Max’s current obsession is peanut butter toast. I’ve always given it to him as a snack or part of a meal, but it hasn’t been until recently that he decided that he LOVES it and asks for it multiple times a day. EVERY day. It means we are going through a ton of peanut butter and I usually make myself a slice of peanut butter banana toast while I’m at it, sprinkled with hemp hearts, because it is THEEE ultimate snack. That has been one of my favorite post-workout snacks since I was in high-school. I just find it so satisfying! So we obviously aren’t eating peanut butter toast today, but all that gibberish above has reignited my passion for peanut butter in a savory way. Thai food ranks high up there on my list of favorites, and the chopped peanuts on salads and noodle dishes are always something I really look forward to. But it wasn’t until recently that I made my own peanut dressing that I’ve been keeping in the fridge for weekday lunches. I’ve made a thai dressing before WITH peanut butter, but it’s never been the star of the show. It’s just had a hint of peanut butter, mixed with lots of other flavors like sweet chili and garlic and what not. This dressing? It’s peanut butter BASED. It’s loaded with peanutty flavor. I wanted to keep the salad simple. Definitely chicken, because chicken and peanut sauce is a thing. A thing I just really enjoy. One of the only ways I really enjoy chicken! I used our favorite method of broiling boneless, skinless chicken thighs and brushing them with a mixture of honey, peanut butter and apple cider vinegar until somewhat caramely. WHOA. Chicken this way is freaking fantastic. Tons of avocado because I have no idea how to make a salad without it. The base is full of napa cabbage and slaw mix, which we almost always have in our fridge because it’s our favorite taco topping and we use it every week. Especially right now, on fish tacos! Some cucumbers for crunch, some lime juice and some crunchy peanuts. Because TEXTURE. It’s the highlight of my food life. There are a few shredded carrots in the slaw mix, which is the only way I can do them. But if you want whole carrot sticks or chunks in here, go for it! And even though this isn’t technically a chopped salad, with the use of the slaw, I end up chopping it all up as I go to eat it. That way I get a bite of everything, which is my favorite way to salad. Let’s make it a verb. Also! Look at how GREEN this is! It’s perfect for the omg-it’s-April-and-almost-beach-season anxiety. Am I right? The one last thing that tastes delicious with this is… some crushed pita chips. Use ’em as a topping or to scoop up the salad like salad nachos. SALAD NACHOs. Can we make that thing? Heat the broiler on your oven to high and place an oven rack 6 inches below. Line a baking sheet with foil. Combine the cabbage and slaw mix in a large bowl and toss it with a pinch of salt and pepper. Add the chicken on top along with the avocado, cucumber and chopped peanuts. Drizzle on the dressing, toss and serve! Whisk the ingredients together in a large bowl until smooth. This can be stored in the fridge in a sealed container for a few days! I already feel better about my cadbury egg mishap this weekend. i’d TOTALLY faceplant into this salad! the way you roast your chicken also sounds amaze…going to have to keep that in the back of my mind! Peanut butter for breakfast, lunch, and dinner! Yay! This sounds like my kind of salad, I would love to faceplant into this. Plus all the texture. We are a big peanut butter house ourselves, but haven’t really used it in savory recipes. This makes me want to try it. Could I use chicken breast over chicken thighs? I think I will try this but grill it instead of broiling. Oh my goodness, this is so crazy! I just had the most wonderful peanut dressing at a Thai place on Friday and I was dying to revisit it! This looks like my perfect solution! I think I’m rewriting this week’s menu to make room for this gem! this salad looks amazing! I totally need to try this asap! This looks/sounds unbelievably amazing. This is definitely a salad I can get excited about! This salad looks like a total texture explosion! The peanuts are a great idea. Aaaaand I LOVE this!!! Bowls and peanut sauce are two of my favorite things EVER. And this post brought back memories of giving peanut butter toast to my kiddos. It’s still one of their favorite after school snacks. ? I feel bad for anyone who has a peanut allergy. This is something that’s NOT worth missing out on. Jessica! I am eating this as we speak! It’s delicious–I love the salty/sweetness of the dressing and the glaze on the chicken was delicious—I have plenty for lunches this week and I’m so excited to keep enjoying it. Thanks for the recipe!! Hmmmm this looks absolutely delicious! Wish I could have some right now! The salad looks awesome but I want to know about the Cadbury Egg mishap! How bad could it have been if it involved a chocolate egg? I’m craving all the satisfying spring salads lately, and this salad makes me want to face plant HARD! 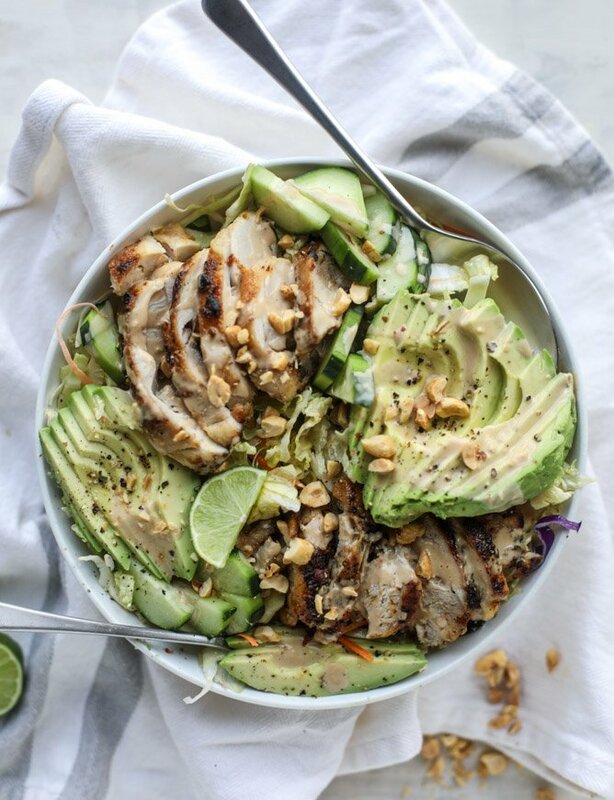 The mix of the avocado, with the flavorful chicken, peanut dressing and pita chips is a perfect 10! This might be a double faceplant. I’m going to make one with and without the avocados. I’m picky but my wife would swim in avocados if she could! Can I rewind my day, go back to lunch and have this instead? Seriously swooning over this perfect bowl! This looks so delicious! Peanut butter plus loads of avocado? This is right up my alley! Question. The dressing is textured like straight peanut butter and super thick. Is that right?? Not a fan of this recipe. The grilled chicken, on the other hand, could stand alone, so not a complete waste of time and money. I had the same problem… I added some water to thin it out a bit, but it was still pretty thick. this looks INCREDIBLE! So delicious. I cant wait to try it at my first BBQ party! I made this last night, but did grilled chicken breast instead. The dressing is to DIE FOR. I did omit the garlic, because for some reason with this pregnancy, I really dislike garlic. I added a dash of cayenne which seemed to work great. I had purchased rice vinegar for another recipe, so this was my first time using it. Terrific. This dish sounds absolutely amazing. The salad nachos idea also sounds perfect for a spring day or out by the lake! I need warm weather now! Thanks for sharing, its wonderful! 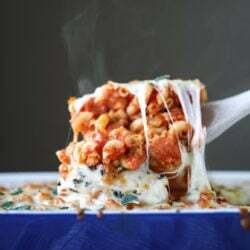 I made this for tonight’s supper and it was amazing!!! Thank you so so much!! Made this for dinner tonight, so good! Only change I would make is thin out the dressing a little bit somehow! We aren’t eating peanut butter at our house right now, so I am going to try making it tonight with Tahini instead. . . and maybe a little cholula for a kick! Looks amazing!! Oh wow this sounds incredible. Definitely trying this one out this weekend. Ok, I made this for dinner tonight, but the dressing is nowhere near a dressing. More like a sate sauce. Thick, not runny, and not resembling the photo. There is really no way I could have done this wrong. Is something missing in the recipe? I’m peanut butter obsessed and cannot believe that I haven’t made this salad yet! Definitely adding it into the meal plan for next week–thanks for sharing! I made this for dinner tonight and my boyfriend and I both totally loved it. The dressing is so good that I was continually dipping the spoon into the bowl, licking it, and then re-dipping it! This will definitely be a regular appearance in our dinner rotation. Hey, my dressing was really thick, what do you recommend? Made this for dinner this week and it was SO good! I’m not a big chicken eater either; I usually find myself picking through it in salads, but the way this is prepared and flavored, it actually might’ve been my favorite part of the salad. Thank you for the easy, healthy, and delicious recipe! That is an incredible salad. Do you know how many calories there are in it? It looks as if it will keep you full for days. This looks so good! What a yummy hearty lunch prep idea too!